Click the button below to add the BEZELWORKS PENDANT w/STRAP CLASS (2-Day class fee; kit purchased separately)) to your wish list. Wear that mystical, bead-bezeled stone close to your heart! Use tubular peyote, circular peyote, and spiral tube Ndebele stitches while exploring design ideas about fringe, edge, bail, surface embellishment and strap. The BezelWorks Pendant has a Center Piece, around which we create a bezel or frame, then do some edge and surface embellishment. Attached to this Center Piece is a bead woven butterfly bail. This piece hangs from a bead woven strap. For the bead artist working from an Art perspective, the frame, embellishment, bail, and strap should be seen as supplemental to the center piece. But if working from a Design Perspective, all these components should be seen more wholistically. So, not only will we be creating a beautiful piece in this workshop. We will also be discussing the implications for the choices we make about each element or component for creating a successful and satisfying piece. This includes our choices about managing the transition from one element to the next. If jewelry is "art", is the entire piece the art, or only the center piece, or central focal part the art? Classical art theory holds that the fringe, strap, edging, bail, and other similar parts should supplement or support the center piece or focal center. This theory holds that these jewelry structures are not art. They should function like a frame to a painting, or a pedestal to a sculpture. It is, however, often difficult to separate the jewelry's anatomy like this, with one part important and the other parts supplemental. This BezelWorks Pendant project is, in part, designed to foster ideas, discussion and debate about the roles of fringe, edge, strap, bail and surface embellishment. Each of these is critical to the finished piece. 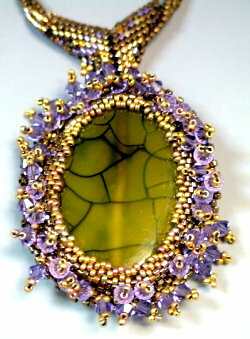 The central project: A BezelWorks Pendant, with open-back peyote bezel. How do we go about designing an aesthetically pleasing, well-functioning, center piece? What functions does the center piece serve? How do we make choices about size, design, proportions, placement? The Center Piece has a bezel, creating an interior edge encircling our stone. In addition, the we weave a frame around the entire Center Piece, creating an additional key edging component. Edging is used to give a finished look to the piece. It might be used to hide threads. It might be used to hide any irregularities in how beads line up or are juxtaposed. An edging strategy is especially critical, however, for creating, preserving, blurring, or otherwise affecting the boundary line, line curvature, and/or silhouette of the center piece or the piece of jewelry as a whole. What role does the “border” of a piece play? Does it mark a beginning/ending? How does it help the viewer appreciate the emotional content of the piece? What kinds of positioning issues are associated with the placement on an edge, boundary, border or line? We weave Fringe Embellishment off our Frame. So what exactly is fringe, and what can fringe be? How does the fringe make the piece more or less satisfying? There are numerous possibilities. In good jewelry design, the Fringe and/or other Surface Embellishment would play either a supporting, or a co-equal role, with the center piece. It would not overwhelm or be overdone. It would seem as if the fringe were organic part of the piece. It would not seem like an afterthought. If it's primary purpose is to hide flaws, no one should notice. Too often, designers overdo the fringe. The Center Piece hangs from a thin, twisted Ndebele tube Strap. What are the visual and functional purposes of the strap? What should the strap look like? How should the strap be connected to the piece? Where should the strap be connected to the piece? To what extent is or should the strap be as an integral part of the piece of jewelry as art? How does the strap define a silhouette? How does the strap make the piece more or less satisfying? In our piece, a Bail is connected directly to the Center Piece, and the strap moves through it. A bail changes the visual and artistic relationship between the strap and the center piece. How might this be helpful, and how not? The bail poses similar design challenges as the strap -- size, proportion, placement and attachment. However, it has to succeed at one additional task -- it has to control the visual, aethestic and functional transitioning between the center piece and the strap. We have two things which serve as "Canvas". The most obvious is the stringing material. In this project, we use beading thread for some parts, and a cable thread for others. The other part which serves as "Canvas" are the woven beads which for the basis of our Frame, and off of which we add Fringe. The "canvas" in a piece of jewelry may be the stringing material, and how it is worked off of. It might be another piece of beadwork, such as a beaded base, off of which some center piece is developed. It might be a core line of beads. It might be a piece of fabric or other material. How does the canvas influence the interpretation of jewelry as art? How should the canvas interact with the main piece and its components? To what extent should it become part of the artwork itself; and to what extent, not? Classic Art theory suggests that the canvas should NOT be a part of the artwork at all. The skill level required: Intermediate/Advanced. The student must be comfortable with tubular peyote and the ndebele stitch. To learn how to manage transitions from one section of a necklace to another. The BezelWorks Pendant involves the creation and management of a set of "anatomical" parts. The challenges are many, and include creating a piece where each individual component is enhanced when brought together, but does not overwhelm. The Center Piece must maintain its sense of focal point, yet not dominate the other elements to the point where they are immaterial, or less important, to an appreciation of the whole finished piece. - Discussion of "Jewelry as Art" vs. "Jewelry as Craft" vs. "Jewelry as Design"
You can purchase an optional kit, available in one color palette. This class is typically offered once every other year. It is also included in one of our Jewelry Design Camp Sessions.